THE REVIEW: Cape Fear is Martin Scorsese’s remake of the 1962 film of the same name. Not having seen the original, or read The Executioners — novel on which both films are based — I can’t comment on similarities or differences. One big change from the 1962 version that I discovered by reading this piece by Roger Ebert is that Sam Bowden (portrayed by Nick Nolte) is flawed and stricken with guilt, compared with the 1962 film where Bowden (portrayed by Gregory Peck) was an all-around good guy looking to protect his family. The lighter 1962 version might also work (again, I haven’t seen it), but Scorsese’s darker approach works extremely well for Cape Fear. His style is heavily influenced by Hitchcock here using odd camera angles and some long, wide shots to build suspense. You the viewer are really navigated through this film by the camera as it directs your attention and your emotions to a dark and scary place. Scenes like the one in the school theater between ex-convict Max Cady (Robert De Niro) and the fifteen year-old Danielle Bowden (Juliette Lewis) are palpable. From the eerie hallway shot to the dark and desolate interior of the theater, that entire scene is just a new meaning of creepy. Seeing Sam Bowden’s gradual descent into paranoia and fear is also quite the sight to behold. Nolte and De Niro both do amazing jobs at carrying the animosity between the two men and leading the film into darker and darker territory. Not only is the film dark and creepy, but it is ominous and foreboding as well. Those long, wide shots I mentioned before contribute a lot to this feeling. One might think this makes Cape Fear slow and monotonous, which is true, but you never get bored. Despite being slow, the film keeps you on your toes, building up the tension and anticipation for what’s next. Scorsese crafts this beautifully throughout the film and delivers moments of horror, cringing, and pure shock. There were a few moments in the film where I almost had to look away it was so frightening and disturbing to watch. Cape Fear is definitely a great film to watch late at night in October to thoroughly freak you out and keep you up all night. It is also a great film to watch for the style and craftsmanship, which is heavily influenced by Alfred Hitchcock and filmmakers of yore. 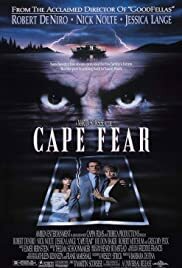 Not an instant classic, but Cape Fear is definitely a great film to keep in the chamber, ready to evoke some emotional responses that not many films can do.